Nature, 2004, 432, 731 (December 9 issue). 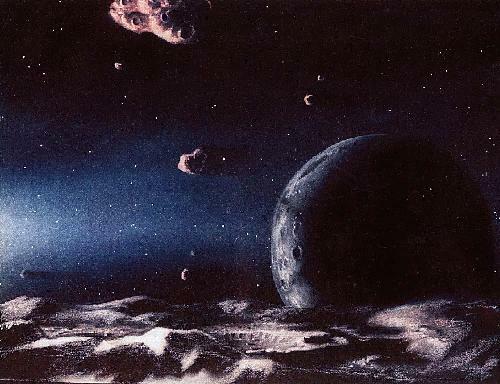 The Kuiper belt is the repository of the Solar System's most primitive ices and organic molecules and is widely thought to be the source of the short-period (specifically "Jupiter Family") comets. For these reasons, there is great interest in determining the compositions of the Kuiper Belt Objects (KBOs) but, owing to the faintness of objects beyond Neptune, this has proved fantastically challenging even with the world's largest telescopes. 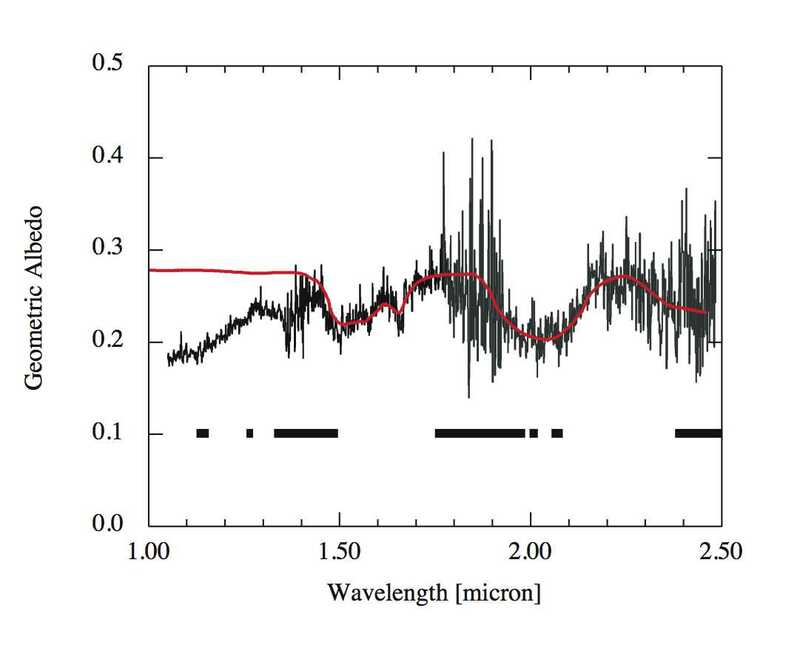 In the Nature paper, we present the first high quality spectrum of bright KBO (50000) Quaoar taken with the CISCO spectrometer at the Subaru 8-m telescope on Mauna Kea. The crystallinity of the ice indicates something about the temperature history of the ice. The surface temperature of Quaoar is only 50 K (-220 C) and, at these low temperatures, the thermodynamically preferred form of ice is amorphous (meaning "structureless": the water molecules freeze where they stick in a jumbled pattern). Our Subaru spectrum shows instead that the ice is crystalline (from the 1.65 micron absorption band, which is weak or absent in amorphous ice). Crystalline ice, in which the water molecules are arranged in a regular lattice-like pattern, indicates formation at temperatures in excess of 110 K (about -160 C). Our data show that the ice on Quaoar has at some time been raised in temperature above 110 K, the critical temperature for transformation from amorphous to crystalline. Two ways to heat the ice are 1) to form it at temperatures above 110 K, presumably beneath the frigid surface, and then somehow expose it to view from Earth. Warm ice could be excavated by impact from deeper layers, or blown onto the surface by low-level cryovolcanic outgassing through vents. 2) Ice on the surface could be heated above 110 K by micrometeorite impact. The extra wrinkle is that crystalline ice, however it came to be emplaced on the surface of Quaoar, is itself unstable. Bombardment by energetic particles from the solar wind and by cosmic rays breaks the bonds between molecules in the crystalline lattice producing amorphous ice. The timescale for this "back-conversion" of crystalline to amorphous ice is uncertain but probably on the order of 10 Myr for the surface ice. 10 Myr is effectively "yesterday" compared to the 4500 Myr age of the solar system. This means that whatever process emplaces the crystalline ice (basically either impact gardening or cryovolcanic outgassing) has been active in the immediate past and, indeed, is probably still active. A two-step scenario seems plausible. First, buried ice is heated by radiogenic decay in the interior of Quaoar. Ammonia in the ices depresses the melting temperature and crystalline water exudes onto the surface, much as we have seen in Voyager images of the icy (and crystalline) satellites of Uranus (e.g. 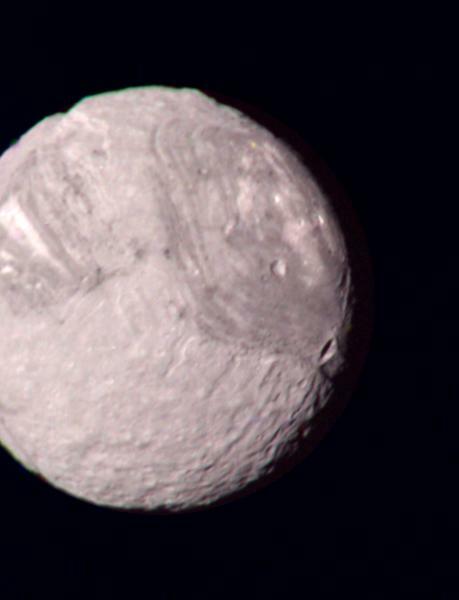 480 km diameter Miranda). This probably happened billions of years ago when radioactivity was a little stronger than it is now. Second, some resurfacing process (impact gardening or burps of gas with entrained ice crystals percolating to the surface) replenishes the optical surface on a much shorter (<10 Myr) timescale, erasing the destructive effects of energetic particle bombardment. While the interpretation remains speculative, the good news is that we are, for the first time, able to take useful spectra that reveal unexpected and intriguing properties of the surface of distant Quaoar. The Nature paper is linked here as a pdf file. An associated "News and Views" riff on this paper by Dave Stevenson. Some notes about how to pronounce Quaoar are here.